Posted 20 November 2013 under Ask Us. Having unwanted or extra hair on places such as your upper lip, chin, or neck can be mildly annoying to severely distressing, but there are many different ways to remove it. The methods vary in effectiveness and cost. 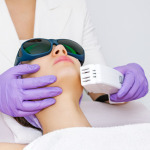 Some types of hair removal options are temporary and others are permanent. It’s very important to be aware that certain methods of hair removal are NOT SAFE for all skin types and colors. Reactions from a hair removal product such as scars and burns can look far worse than hair. Talk to your health care provider first, then check out local salons and spas and remember to test a small area before applying the hair removal product on larger areas.